Someone recently asked me how I would invest a million dollars to help conserve Lake Erie. When I really thought about it, the answer became clear: if I had a million dollars to spend on Lake Erie, I'd hire a public relations firm to remake our collective perceptions and rebrand the world's 11th largest lake. Someone recently asked me how I would invest a million dollars to help conserve Lake Erie. My first thoughts were that I would use that money to protect wetlands and other habitats on the coast, or maybe to help farmers create wider buffer strips along creeks that flow into the lake. Now these are certainly all good and important actions, but perhaps don't dwell deeply enough into the lake's real issues. When I really thought about it, the answer became clear: if I had a million dollars to spend on Lake Erie, I'd hire a public relations firm to remake our collective perceptions and rebrand the world's 11th largest lake. As a kid growing up in the 1970s my impression of Lake Erie (and all of the Great Lakes) was that it was dirty and polluted. I remember my parents telling me not to touch the water at the beach. My parents' reluctance to let me wade into the lake was probably the influence of both Johnny Carson and Dr. Seuss. The late night talk show host referred to Lake Erie as "the place fish go to die," in 1976, and The Lorax rhymed Lake Erie with "dreary, weary and smeary." A joke, and perhaps just an unfortunate coincidence that nothing more positive rhymes with Erie, but these two popular culture references have shaped our impressions of the lake. Now in fairness, the descriptions by Johnny Carson and Dr. Seuss were not without reason. More than any other Great Lake, Lake Erie is located at the epicenter of the industrial, urban and agricultural heartland of North America. It's the shallowest of all the lakes, and what goes on in its watersheds, rivers and coastal waters has a very immediate impact on water quality. Although the relatively clean waters of Lake Huron feed Erie, from the post-war era to the 1970s these waters passed through a gauntlet of pollution -- including "chemical valley" on the St. Clair River and outflows of raw sewage from Detroit and Windsor on the Detroit River. Major U.S. cities such as Cleveland and Toledo also dumped sewage and spilled urban runoff into the lake. In the days before modern wastewater treatment, this sewage not only contained a lot of, well, sewage, but also a huge load of nutrients and phosphorus from soaps and detergents. These were dark days for the waters of Lake Erie. The nutrients pouring into the lake created massive blooms of algae, making the waters, in Dr. Seuss' words, weary, dreary and smeary. Drinking water was tainted or even dangerous, and in some summers, the only open beaches to which you could take your family were shallow waters enclosed by a plastic barrier and sterilized with bleach. And Johnny Carson was right: a lot of fish died, although I'm sure most of them didn't come to the lake for this. Some fish died better than others. Many succumbed to a lack of oxygen that when all that algae started to decompose. Others died of tumors and deformities from toxic pollution. Lake Erie lost 10 species, including the ancient paddlefish (now gone from all the Great Lakes) and the blue walleye -- a sub-species that was endemic to Lake Erie that is now extinct. It was also a time when Lake Erie literally had burning issues. Slicks of petroleum pollution on one of the rivers that feeds into Lake Erie, the Cayuga, lit on fire several times. That burning river was one of the sparks for the environmental movement in the late 1960s. Lake Erie showed that burning rivers, dead fish and stinking water are good motivators for environmental action. The public demand to solve these issues were one of driving forces behind the first Great Lakes Water Quality Agreement in 1972 between Canada and the U.S. This agreement contained several commitments, but the main ones were that water shouldn't stink, all the fish shouldn't die and rivers shouldn't burn. 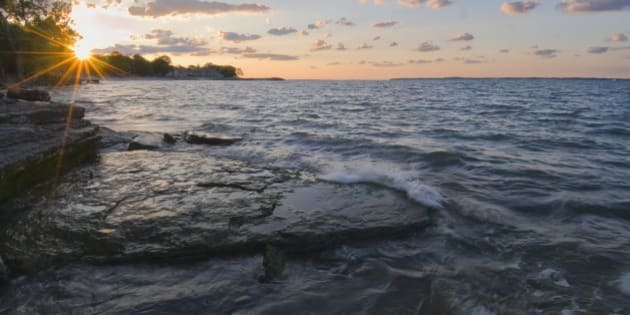 The first Great Lakes Water Quality Agreement resulted in some really important actions that still benefit everyone that lives around Lake Erie. There were restrictions on phosphorus, upgrades to sewage plants and reductions in toxic chemicals dumped into the lake. A number of Areas of Concern were identified and governments committed to taking an ecosystem approach to lake management. These were the golden days of bi-national cooperation around the Great Lakes. And the crazy thing is that it worked. There were significant improvements in drinking water quality, beaches were re-opened and both commercial and recreational fisheries thrived. Habitats and water quality at some of the toxic hotspots started to improve. Rivers didn't burn anymore, and fish stopped growing tumours. The problem is, many people didn't know about these changes, or about the ecological rebirth of Lake Erie. Although we saw some amazing improvements in the 1980s, most people still thought of the dreary, weary and smeary Lake Erie of the 1960s and 1970s. Now, this was partly the fault of the good people that were cleaning up the lake. Governments just focused and funded mending the bad places, so people mostly heard news stories about the progress in pollution abatement, and the need for more clean-ups. People started to hear about something else that was going on in Lake Erie in the 1990s. We would be at a different place with the recovery of Lake Erie today if it wasn't for one small oversight in our management of the Great Lakes. As water quality improved through the control of nutrients and toxins, we forgot about a different kind of pollution that was entering the lake through the ballast water of oceanic tankers that originated from foreign ports - biological pollution in the form of unwanted invasive species. Zebra mussels were the first of the newcomers in the 1980s. Native to the Caspian Sea, zebra mussels found Lake Erie to be a wonderful new home. They also found that it was largely empty, with many of the native clams and clam-eating fish, such as the lake sturgeon and whitefish, now in very small numbers. Ideal habitat, lots of food and no predators -- it was the perfect formula for a population explosion. Zebra mussels drastically changed the lake ecosystem by filtering plankton and covering the lakebed and beaches with billions of shells. Zebra mussels got Lake Erie a lot of attention, but as with burning rivers and stinking water, it wasn't very positive. Zebra mussels clogged intakes for drinking water, fouled the bottom of boats and made walking on a sand beach in bare feet a risky venture. Preventing invasive species may be one of the greatest missed opportunities for ecosystem recovery in North America. While we focused on putting out the fires of pollution, we left the back door open to unwanted guests. Recently, Lake Erie has been experiencing flashbacks to the 1960s and '70s, with satellite images showing psychedelic green patterns caused by massive algal blooms. This old problem has a new cause: nutrients are now coming into the lake via streams, rivers and drains that flow through agricultural lands, and urban run-off from lawns, asphalt and concrete. This new nutrient pulse is probably caused by a combination of more intensive agricultural land use (which includes planting more corn and soy, and less pasture and hay), changes in how and when farmers apply fertilizer and more intense rainfall events due to climate change. These heavy rains flush more soil and nutrients into the lake compared to a gentle rain. In the last few years, this has created dead zones in the lake caused by rotting algae absorbing all the oxygen in the water, and made parts of the lake look like pea soup. In 2014, Toledo and other communities in Western Lake Erie declared a drinking water emergency, and over half a million people had to rely on bottled water. These recent issues should not obscure evidence for hope. Despite generations of exploitation and inappropriate use, Lake Erie is still a place of extraordinary richness, diversity and beauty. It has large, rich coastal wetlands, miles of sandy beaches and dunes, and the islands in the western basin have more species and habitats that almost anywhere else in the Great Lakes region. It is also a lake of extraordinary resurrection. Both the recreational and commercial fisheries have made a comeback, and even the lake sturgeon is recovering and is again spawning in the Detroit River. Water quality is better than it has been in generations. This is why Lake Erie needs a public relations boost. For over two generations, the mainstream messaging about Lake Erie has been that it's polluted, on the brink of death, and is the epicenter for the zebra mussel invasion. True, but it's also a lake of surprises. The recent Lake Erie Biodiversity Conservation Strategy highlights some of the important features of the lake. Perhaps most importantly it identifies that while we certainly need action in our cities and farms to restore the lake, there are species, habitats and places that we need to protect today. The protection and restoration of Lake Erie is critically important for nature, and for the health of communities and people. This post originally appeared on www.LandLines.ca, the blog of the Nature Conservancy of Canada.